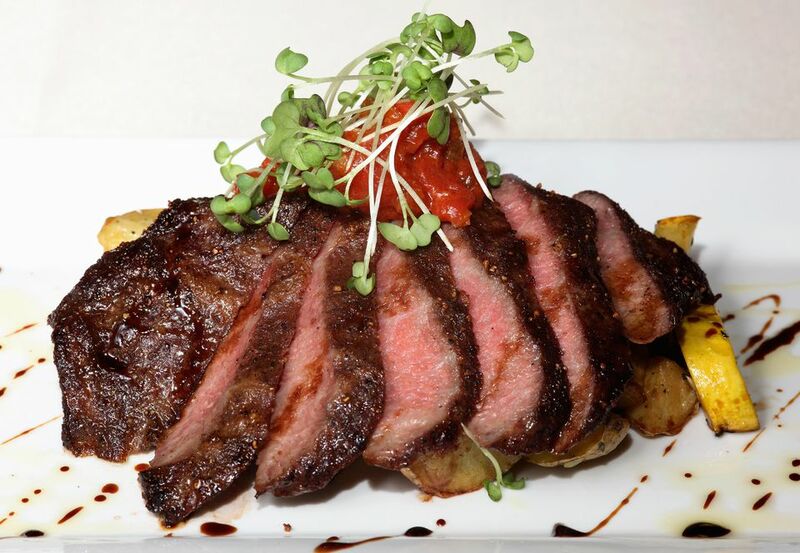 Flat iron steaks are fairly new on the market, first appearing in 2002. This steak is versatile and very flavorful. And it's easy to cook. Marinate the steak, then grill it to medium-rare or medium. Let it stand for 5 to 6 minutes, then slice it against the grain in thin strips. Place the steak in a shallow dish. Use a fork to prick the steak deeply, all over its surface, on both sides. Pour over steak; cover and refrigerate for 1 to 24 hours. When ready to grill, prepare and preheat grill. Cook steak over medium coals for 3 to 4 minutes on each side, turning once, until medium doneness. This steak should not be cooked to medium-well or well-done, or it will be very tough. Place on cutting board, cover with foil and let stand 5 minutes. To serve, position the steak, so the grain is running from left to right. Hold the steak using tongs with your non-dominant hand. Using a very sharp knife, place the knife on the steak, then tilt it to the left. Slice the steak thinly. When you slice against the grain, make sure that you've lined up your sharp knife across the strands, not parallel to them. Cutting against the grain will make it easier when you chew these pieces, as this type of steak has a tendency to be tougher than other cuts.